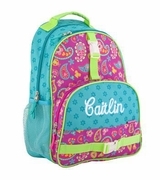 Cute backpack for school girl with monogram. Going back to school on the first day can be a daunting experience! 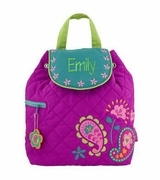 Make it fun with our super cool backpack filed with all your young girl's needs to get through the day. The bag has a trendy ice pop design in multi shades. The pattern is neatly contrasted with hot pink trims. Made with a classic design, the bag offers a spacious main compartment with a zip closure, a zippered extra front pocket and two side smaller pockets. The bag can be carried using the padded top handle or the adjustable strong shoulder straps. This versatile bag is also great for weekend trips, visiting friends and carrying games and electronic devices. Makes a perfect back to school set when paired with our ice pop lunch tote search item SWT-NCC1725ICE for a young lady with a sense of fun who wants to look stylish too!